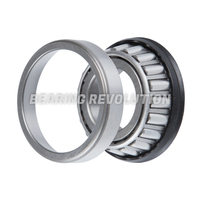 At Bearing Revolution we have a wide range of taper roller bearings in stock and ready for dispatch, we hold both imperial and metric taper bearings in stock and also a vast range of trailer bearings too - we stock all popular and hard to find bearing taper roller bearings in our stock range of over 12.5 million bearing related products. 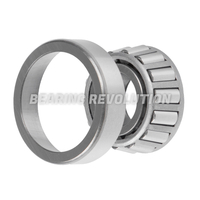 Taper roller bearing can support axial forces and radial forces. The inner and outer rings of the raceways are segments of cones. The rollers are tapered in a way that the surfaces of the raceways, and the roller axles would all meet at a common point on the axis of the bearing. This makes it so that the motion of the cones stay coaxial and that there are no sliding motions between the raceways and the outer dimension of the rollers. Pairs of a taper roller are commonly used in cars and vehicle wheel bearings where they are required to simultaneously cope with large horizontal and vertical forces. 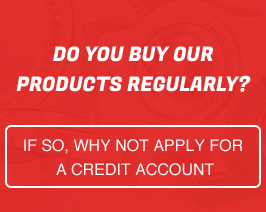 Common applications are used in agriculture, construction, gearboxes and engine motors. 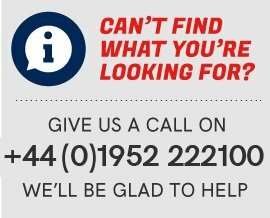 The Bearing Revolution team understand that there is wide choice of taper roller bearings and choosing the wrong one can take up precious time, so if you are unsure on which product to purchase you can call us on 01952 222100 and we would be glad to help guiding you to purchase the correct taper roller bearing.